Based on a real 1906 coal mine accident in France but updated to 1930-ish and transplanted to the French-German border, G.W. Pabst's “Kameradschaft” (1931) opens on a note of despair. Not the disaster that will claim the lives of many miners, but rather the deep-seated nationalist divisions responsible for millions more deaths. German workers try to cross the French border each day, but are turned back so they won't steal jobs from French miners who might have steady work, but little more, and surely not enough to share with foreigners. Tensions manifest on more personal terms when a German man in a French bar abruptly finds himself surrounded by a mob itching for a fight. 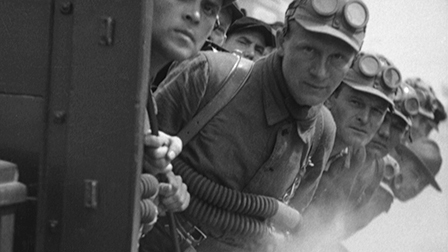 Centuries-old ethnic tensions are quickly forgotten, however, when the first underground explosion sends a plume of black smoke belching into the sky above the French coal town. The warning “Gas! Clear out!” is met from across the border by the cry “A miner is a miner!” as German workers spring into action to help their French compatriots, though only after a struggle to secure permission from their bosses, who don't necessarily feel the same sense of solidarity as the proletariat. Just a few years into his sound film career, Pabst uses cinema's newest dimension to remarkable effect, most notably with the relentless clanging on metal pipes used to signal rescuers. Creaking and rumbling, both near and distant, constantly heightens the sense of imminent danger as one section of the mine after another gives, soon leaving little hope for salvation, little but still some. After the unrelenting grimness of his World War I movie, “Westfront 1918” (1930), Pabst appears more inclined to believe in the potential of a happy ending as long as good people work together towards a common cause. Some of the stage sets are a bit too large to evoke the true claustrophobia one might expect from a mining disaster, but the wider space gives Fritz Arno Wagner, one of the most celebrated German cinematographers of the era (ever heard of the Wagner projects “Nosferatu” and “M”? ), ample room to explore every corner of these crumbling rooms with highly calibrated precision. It really is a remarkably filmed movie – I'm thinking in particular right now of the way the camera traces the miners' desperate search for a ringing phone amidst the rubble, hoping to preserve their one last longshot at salvation, but Pabst and Wagner concoct one astonishing shot after another. Of course, the film doesn't suggest that one instance of solidarity will erase the nationalist stain. The tragicomic spectacle of a marker noting the exact spot of the French-German border about half a mile underground provides testament to the enduring stupidity of humans from all countries, but “Kameradschaft” also argues that they occasionally have the capacity to achieve something transcendent. The film is presented in its original 1.19:1 aspect ratio, an unusual ratio used in the earliest years of sound cinema. 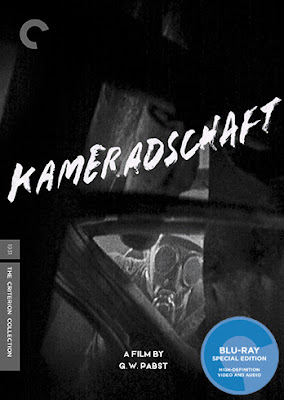 The 2014 restoration by the Deutsche Kinemathek was created from a 35 mm duplicate positive of the German version of the film from the BFI archives, but the final scenes were taken from a 35 mm nitrate original camera negative of the French version from the CNC in Paris. The high-def transfer isn't nearly as strong as the one on Criterion's release of Pabst's “Westfront 1918.” It looks a bit soft at times and somewhat unnaturally smooth, less grainy than one would like. There are also several instances of damage visible throughout, no doubt endemic to the source prints, as well as a few missing frames skipped along the way. And the quality drops off notably at the end. Still, it's a strong enough presentation for such a fine film. The linear PCM mono audio track has a few dropoffs, with a particularly noticeable one at the end when we switch to the French source print, and has an overall hollow, tinny quality. It's OK, but nothing special, and it's clear enough throughout. Optional English subtitles support the German and French audio. Criterion hasn't quite stacked the disc with extras as they usually do, but we get nearly an hours' worth of illuminating interviews. First up, film scholar Hermann Barth (2016, 30 min.) discusses both Pabst's career and the film's production, with the helpful observation that Pabst was actually more popular in France than in Germany at the time, making the choice of subject matter for this film a natural fit. Barth also offers a detailed analysis of the script in various drafts, and the changes when the project was finally brought to screen. Film scholar Jan-Christopher Horak (2016, 15 min. ), also featured on Criterion's “Westfront 1918” release, returns with more information, including the fact that the film was originally released without subtitles, so French viewers wouldn't understand the German speakers, and vice-versa. He also talks briefly about Pabst's career after the film, including both his brief move to Hollywood in the early '30s and his unfortunate return to Austria at the end of the decade. We also get an audio-only interview with the film's editor Jean Oser from 1988 (12 min.) Some of the video played with his audio shows an alternate cut for the film's French release. The insert booklet includes an essay by author and critic Luc Sante as well as the short 1930 text by writer Karl Otten on which the film was partially based. Pabst's career peak may not have extended long past the early '30s, but Criterion's dual releases of “Westfront 1918” and “Kameradschaft” prove clearly he had little trouble negotiating the transition to sound. This lean thriller may not quite be what you expect from the director if, like me, you know him best from films like “Pandora's Box” (1929), but it's tense, briskly-paced and quite riveting.